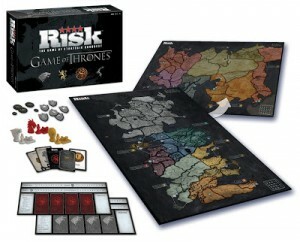 I had talked about Game of Thrones Risk after Toy Fair, but I wasn’t able to post any pictures. Now, with the game coming out in July, pictures are starting to pop up. That’s a ton of stuff packed in there, and worth the price of admission. There will also be two new ways to play that feature the warring of the noble houses and Daenerys’ rise to power in Essos.